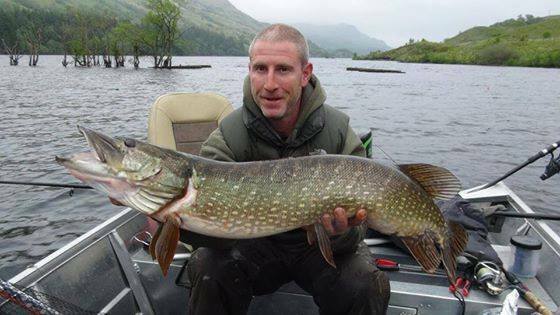 Welcome to Loch Katrine Fisheries, set in the heart of the Loch Lomond and the Trossachs national park. Surrounded by breathtaking scenery, Loch Katrine is regarded as one of Scotland's best pike and wild brown trout fisheries. The Loch is 11 miles long, up to one mile wide, and over 500 feet at its deepest point. The whole area is steeped in history - Rob Roy MacGregor was born at Glengyle House at the western end of the Loch and the area was a favourite with writer and poet Sir Walter Scott. Since 1859 Loch Katrine has served as the freshwater reservoir for the city of Glasgow, therefore no petrol engines are allowed on the loch due to the risk of pollution. We are operating using environmentally friendly 5hp propane outboard engines with biodegradable lubricants. Loch Katrine can be reached by car from both Edinburgh and Glasgow within 60 minutes. We offer boat rental for day, weekly and season permits for trout fishing. Season permits only for pike fishing. We also provide fully guided fishing trips and tuition. Please contact us via phone or email about availability and prices. We are open year round, 7 days a week from 09:00 - 1700. Evening sessions are available during the summer months (20th May - 20th July) from 18:00 - 22:00. 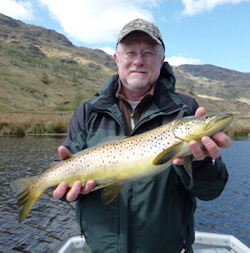 The Brown Trout season is from 15th of March until 6th of October. The Pike season is from 11th of May until 31st of March. For boat booking and information please call the fishery on 07591 099 826, send an email to info@fishlochkatrine.com or use the form below.